Square root calculator - step by step with explanation. Problems with visualization of square root tool, please review your browser cookie settings. If the problem continues then you can use this link to square root calculator. 1 – Radical is the symbol that indicates a square root. 2 – Radicand is the number that you get the square root. 4 – Lines auxiliary help us solve the square root. 5 – Waste, is the end result of the process to solve the square root. With this other calculator you can check fastly your results, if you inform the result you will obtain the radicant and if you write the radicant you will get the result. You can select the degree of the root, 2 if you want square root, 3 to use cube root and so on. This square root calculator works with numbers from 0.00 to 999999.00. Enter the number you want to calculate and press “Start”. Your number will be used as radicand. 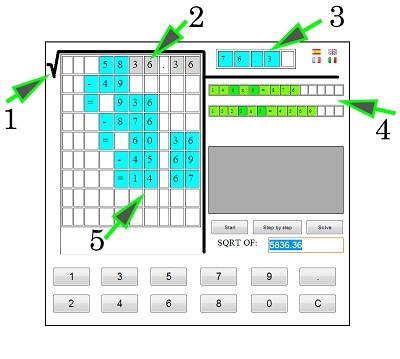 Now every time you click on “Step by step” of this square root calculator, you will get a little explanation of how calculate the square root by hand, step by step. At any time you can press the button “Solve” to resolve completely the square root. Sqrt of x will be the result which appears at the top right of the radical. Having the option to resolve the square root step by step allows you to stop at each step and learn at your own pace, spending more time on the steps where you have more questions. If you have doubts in some step, please, let us know in comments, thanks. Then, the “square root calculator” of a number is a value, that, multiplied by itself, gives the number. Separate the radicand (in the example, 5836.36) in groups of two digits. The separation is done from the decimal sign (if exists) to the right and to the left. If the side of the decimal (to the right of the point, ie 36) there is an odd number of digits then we add a zero to convert to even. If the left part of the point, (ie, 5836) remain a single digit, don’t worry. In the picture the radicand is 5836.36, we divide into groups of two digits, and get: 58/36.36. We must be find the nearest perfect square below the selected group of the radicand, in the example 58). The result can not be greater than 58. After finding it, the digit is added to the root as the first digit of the result. In this case the number would be 7, because 7 × 7 is 49. Another possibility would be 6 × 6, giving 36 (which could be further from 58) and 8 × 8, giving 64 (which would exceed 58). The number obtained (7) is the first digit of the square root. In the previous step we wrote in the box on the right. Now multiply it by itself. The result (49) is written below the first set of figures on the left (58), and proceeds to subtract. The result of the subtraction (58-49) is 9. Once the result of the subtraction, lowering the next group of two digits (36), so that the next digit of the root is now binding previous subtraction result with the new figures decreases (ie, 936 .) To continue the extraction of the square root multiply by 2 the first result (7) and we write just below it, on the next line assistant (pictured, 14 is written just below 7, because 7 × 2 is 14). In this step you have to find a digit n ([0..9]) that, added to 14, and multiplied, the result is nearest than 936. That is, it could be 141 × 1, 142 × 2, 143 × 3 … and so up to 149 × 9. Often used trial and error procedure to find that number, although the method can be used to split the first two digits of the residue (93) between the auxiliary line number (14). The first number of non-zero result, even a decimal, is generally we seek. The result is added to the number of the root and the auxiliary line. In this case 93 is divided by 14 6. So the operation sought is 146 × 6 = 876 (add operation in the auxiliary line). The following result is the square root 6. Proceed also to be noted in the filing. The procedure is the same as above. The result of the previous operation (876) is placed below the number subtracted from the previous (936) and subtracted. The result of the subtraction (60) is added to the next set of figures from the radical (in this case, 36). If the next group is after the decimal point decimal point is added to the number of the root. The new number is 6036. We resume the procedure from step 3. The figure of the root (76) is multiplied by two (resulting 152). We look for a number that added to 152 multiplied by that number gives us an approximation to 6036. It would therefore be 1 × 1521, 1522 × 2 1523 × 3, etc.. We can do it by trial and error, or by the process of splitting in this case, the first three digits of the root by the first three digits of the auxiliary line (note that previously were the first two digits), ie 603/152 ( the desired number is 3, since the result is 3.9 and we have said that we should take the figure is the first). The operation to be performed is thus 1523 × 3. The result (4569) is placed under the last bit and proceeds to find the difference (which is 1467). Once the subtraction is low the next set of figures and the process continues. Note that the number of auxiliary line and divide residue is increased. Thanks you for using calculator square root. I’m reporting the error message to the administrator. Thanks. An unhandled application error has occured within AppSquareRoot61. Click here to restart AppSquareRoot61. Yes, sometimes the server where the tool is hosted goes down, please, try again thanks. Please, use the square root calculator to learn how to calculate the square root step by step by hand of 4.86. The result is 2.2045…, for each 2 digits yo need repeat teh process.